The Grisha trilogy is one of my favorites. I love the unique world Leigh Bardugo has created along with all her characters. I especially love how it has pieces of Russian folklore—something I haven’t seen in any of the series I’ve read before. If you haven’t read this series yet, you need to get on it! I don’t want to spoil anything for you, but this trilogy is amazing. It will keep you on the edge of your seat throughout each book. 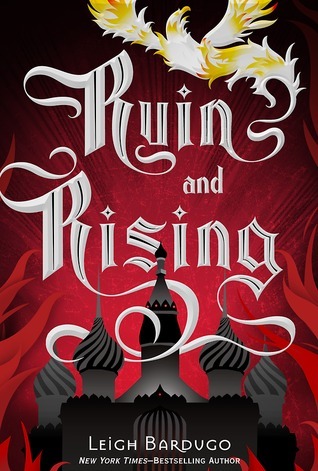 Ruin and Rising will leave you heartbroken in all the right ways. The ending is perfect for the series. Everything you thought you knew will be flipped around. Leigh’s writing kept me flipping the pages faster and faster with all the twists and turns. The romance in this book has taken me on a rollercoaster ride with all the ups, falls, turns, and upside downs imaginable. There are three love interests in this trilogy, and I can honestly say I was rooting for each of them at some point in the series. There’s the best friend, the prince, and the villain. How Leigh pulled each of these off so well? I will never know. In the end, Alina chooses the right boy for the life she needs. I loved how Leigh wrapped up all the loose ends so nicely. I enjoyed this read immensely, and can’t wait for Leigh’s next book, Six of Crows.